The first four men inducted into the Boston Braves Hall of Fame after its formation by fans of the long-defunct National League club were Warren Spahn, John Sain, Tommy Holmes, and Sebastian “Sibby” Sisti. In order, that’s one Hall of Famer, two All-Stars, and one .244 hitter who lasted for 14-plus years in the majors by playing wherever and whenever he was asked. Nobody questioned the selection. Sisti didn’t belong in the class of Spahn, Sain, and Holmes as a ballplayer, yet for the many Braves fans who both watched him perform and attended reunions of the team during the last two decades he was the Boston Braves. The sad-eyed, gravel-voiced athlete-turned-truck driver symbolized the team’s working-class demeanor better than perhaps any other individual, and delighted in returning to town and greeting old diehards who remembered the days of Earl Torgeson, Sam Jethroe, and fried clams at Braves Field. And, lest it be forgotten, he was also one of baseball’s top utilitymen during his career and a key contributor to the 1948 National League champions when he took the place of injured second baseman Eddie Stanky during August and September. A Buffalo native and an only child born on July 26, 1920, Sisti actually had his initial big-league tryout for Boston’s “other team” at the tender age of 15, in 1935. Driven three hours down to Cleveland by area bird dog scout Bill Meyers, he donned a Red Sox uniform and took hitting and fielding practice under the eye of Sox manager Joe Cronin. “I was still a sophomore in high school,” Sisti recalled. “It was a big thing for me, because here I was, the first time I had ever been in a big-league ballpark, and I’m working out on the field with these big major leaguers. I had a Boston uniform on, and it was a little big. There was hardly anybody in the stands, because we were working out early before the game. It was a new experience, and being a young kid there with veteran big-league players -- guys I had read and dreamed about, more or less -- it was a little nerve-racking for me. The Sox didn’t sign Sisti, but a few years later an opportunity opened up with Boston’s National League franchise. Meyers had told another Buffalo-area scout, Jack Onslow of the Braves (then known as the Bees), about Sisti, and at the beginning of Sibby’s senior year at Buffalo’s Canisius High School, his father went along with Onslow -- a former big-leaguer himself who would later manage in the majors -- to meet Bees officials in the Hub. Sibby didn’t know about the meeting until he got a call from his dad informing him that he had been signed to a contract with the team’s Class A Eastern League club in Hartford, Connecticut. Like any 17-year-old kid, he was more concerned with what the news meant to his immediate situation than the exciting future possibilities. Two days later, Sisti left for Hartford. The speedy right-handed batter hit .293 there, playing a sure-handed third base for manager Eddie Onslow (brother of the scout who signed him, and a former Red Sox coach). That winter, Sibby got a letter from Bees general manager Bob Quinn requesting that he report to spring training in Bradenton with the big-league club in ’39. Sisti didn’t really think he had a chance yet at the majors; as he recalled, “I had already signed another Hartford contract. They just wanted me to go down to Boston, maybe get in a few games, and get a little experience with a big-league club.” Initially, he was right. When the Bees broke camp, Sisti went back to Hartford, this time to play second. As a Braves farmhand named Hank Aaron would 15 years later, however, Sisti earned a swift promotion because of another man’s injury. Boston had traded for Reds shortstop Eddie Miller over the winter, and in June Miller and aging outfielder Al Simmons ran into each other in center going after a Texas Leaguer. Miller broke his ankle, and this on top of other injuries forced the club to call for reinforcements. Sisti was batting .312 at Hartford, and on July 21, 1939, 18-year-old “Sebbi” (as some newspapers then called him) suddenly found himself up with the Bees as the youngest player in the majors. That same afternoon at Braves Field, he made his first trip to the plate in the ninth inning of a tight game against the Cubs. Boston trailed 3-1; a reported crowd of just 2,797 was on hand to witness the moment. Sibby held down the job at third for the next two seasons, hitting a more respectable .251 and .259 although he still showed little power and made an alarming 44 errors in 1941 alone (41 of them at third). But despite a return to their old nickname in ’41, the Braves continued to plod along near the cellar. As Sisti later joked, “We finished seventh four years in a row, but we were thankful for the Phillies -- because they finished eighth each year.” In the midst of the team’s travails, Sisti’s determination and passion for the game shone through. He and catcher Phil Masi were often spotted by Stengel taking extra batting and fielding practice, and a special relationship developed between the skipper and his young charges on the long train rides from one National League city to the next. After an eventful offseason that included the Pearl Harbor attack on December 7 and much happier news 20 days later -- Sibby’s marriage to Norine Barone -- more changes were in store. The arrival of rookie Nanny Fernandez to play third base prompted Sisti’s shift to second in ’42, and even though his average plummeted to .211, he got into 129 games (all but five at the keystone sack). It seemed nothing could keep Sisti down with Stengel around, but World War II did the trick -- and Sibby lost the 1943-45 seasons while serving with the Coast Guard. Stengel was fired during this same period, making the task of winning back a spot on the Braves that much harder for Sibby after the war. If Sibby was miffed by his demotion, he took it out on American Association pitching. 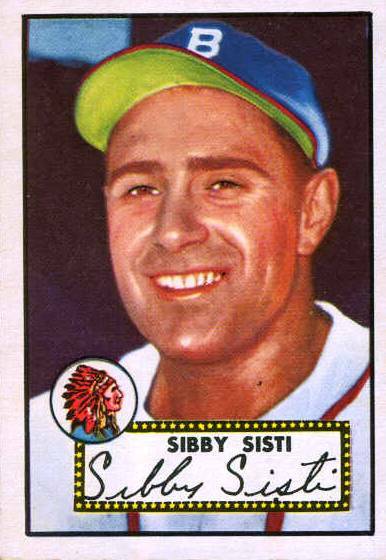 Asked about his midcareer foray to the Indianapolis Indians in the summer of ’46, Sisti said simply, “I had a pretty good year.” He was, in fact, The Sporting News Minor League Player of the Year after leading the Triple A circuit in batting (with a .343 mark), hits (203), and triples (14), while scoring 99 runs and knocking in 86. He was back up to the majors in 1947, signing a Braves contract on January 31 for what newspapers reported as “a nice raise in pay,” and then earning a role as starting shortstop on a quickly rising team. He got off to a great start, but unfortunately a freak play soon derailed Sisti’s campaign. New third baseman Bob Elliott was out briefly with a thumb injury, and Bama Rowell -- normally an outfielder, and much less agile than Elliott -- was filling in. Trying to compensate for the loss of range on the left side, Sibby ran over behind Rowell on a grounder in a July 11 game against Cincinnati. Lunging for it, he landed on his left shoulder, suffered three ruptured ligaments, and was sidelined for more than a month. He wound up playing just 56 games, batting .281. The setback was in keeping with Sisti’s career, which had more than its share of bad breaks, literally and figuratively. As Boston sportswriter Al Hirshberg once assessed, “On the few occasions when [Sisti] seemed to have a job wrapped up and won, he got hurt. When Sisti gets hurt, he does the job completely. The most sewn-up athlete in baseball, he carries the scars of 75 stitches on his carcass, giving him the title of ‘The Embroidered Man.’” In this case, muscle was grafted from his left leg to strengthen his shoulder, a procedure requiring 24 stitches on his leg and 20 on his shoulder. The clutch hit won Southworth over. Sisti had his starting second base job back again after a six-year hiatus, and he kept it the rest of year with steady play in the field (six errors in 44 games) and at the plate (hitting near .300 down the stretch). Sportswriter Howell Stevens of the Boston Post wrote that Sibby “looked like Frankie Frisch in snagging prospective ‘Texas Leaguers’ in short right.” Still, when Stanky returned in late September, Sibby was sent to the bench for the World Series against Cleveland. While he made just two late-game appearances in the Series, Sisti was on the field for perhaps its two biggest plays. In the opener, he was at first base running for Eddie Stanky in the eighth, and had the best view in Braves Field when Indians pitcher Bob Feller and shortstop Lou Boudreau attempted to pick Phil Masi off second. Masi was called safe, although replays (and Sibby later) suggested otherwise, and Phil was then singled in by Tommy Holmes for the only run of a 1-0 Braves win. The Indians took three of the next four games, however, making Sibby’s only Series at-bat, in the ninth inning of the sixth contest, a do-or-die situation. The Braves were down to their last chance of the season, and Sisti, still an adept bunter, was called upon by Southworth to pinch-hit and move the potential tying run from first base to second in a 4-3 game. His bunt attempt resulted in a double play instead, as catcher Jim Hegan caught his pop-up and threw to first to double off Connie Ryan. One out later, the Indians were champions. Sisti never shirked questions about this dubious incident -- nor was he ever forced by Braves fans to wear goat horns as Johnny Pesky or Bill Buckner did after similar miscues for the Red Sox. The public forgave Sibby, perhaps because unlike Pesky or Buckner, he wasn’t a star player expected to win, nor was his team. That winter, in fact, he was honored at a Boston baseball writers’ dinner with a plaque and a pair of cleats for “filling the shoes” of Stanky during the summer just past, and drew shouts of “No, no!” when he tried to take the blame at the podium for his team’s Series defeat. “It was the best thing that ever happened to me in Boston,” Sibby later said of the outpouring of gratitude. He was, in fact, so buoyed by the fan support he received after the World Series that he didn’t even have any trouble donning uniform # 13 in 1951, letting catcher Ebba St. Claire take his old # 7. Although Sisti’s playing time waned after this (he appeared in 100 games just twice in his final eight seasons), he developed a sense of humor about his situation. When Boston sportswriter John Gillooly of the Record-American wrote that Sibby had been “sitting on the bench so long he had enough splinters in his rear end to start a match factory,” Sisti approached Gillooly in the Braves dugout the next day and said, “I have a gift for you in my pocket. This is my manufacturing company.” And he gave him a box of matches. In 1949, with Stanky back at second and Dark entrenched at short, Sisti resumed his role as “Super Sub” -- capable of filling in at any infield or outfield spot save for catcher (although, as the team’s “unofficial” third receiver, he often caught batting practice). Southworth liked to platoon, and that summer Sibby saw almost equal time in the outfield, second base, and shortstop as well as one game at third base. It was more of the same the next three years; no one position to call his own, but plenty of action at a variety of spots. All told, his career of 1,016 games included 359 at second base, 290 at third, 209 at short, 74 in the outfield, and two games at first. He was never again a full-time starter after 1948, but he did get into 114 contests in ’51 -- and batted a very solid .279. Not surprisingly, given Southworth’s faith in him, Sisti was said to have supported the embattled manager during the dissension that reportedly rocked the ’49 team. There would be no chance, however, for Sibby to redeem himself in postseason play. The Braves finished fourth each season from 1949 to 1951, and one by one the stalwarts of the ’48 champions disappeared from the box scores. Still in his early 30s, Sisti became the senior member of the club in terms of tenure, and in 1951 and ’52 he helped develop his young roommate Johnny Logan into one of the National League’s best shortstops. Logan, a loud, tough customer who never backed down from a fight, took an instant liking to the soft-spoken veteran, and the two remained lifelong friends. “He was a baseball man, and I was his student,” recalled Logan. “When I was a rookie, he loved my ability. I asked him, ‘Sibby, can you give me some tips?’ He said, ‘John, remember, if you’re a shortstop, just play natural. Don’t try and copy anybody. Just play your natural game, and get to know your third baseman and your first baseman.’ Sibby Sisti was one of the finest guys that I ever met.” At later reunions Logan relished in giving his good-natured roomie “the needle,” riding Sibby about his late-night habits of reading Westerns and smoking foul-smelling cigars -- which Johnny dumped in the toilet after his friend fell off to sleep. As Logan progressed, Sisti and the team slumped. Sibby’s average fell off to .212 in 1952, and the Braves finished seventh with a woeful 64-89 record. Just 281,278 fans showed up at Braves Field, a far cry from the 1,455,439 who had packed the stands to watch the NL champs just four years before. Still, Sisti was shocked like almost everybody else on the club by what transpired the next March. The team had spent spring training in Bradenton, Florida, as usual, and there was hope that Boston would be a much improved club with promising youngsters like Logan, third baseman Eddie Mathews, and catcher Del Crandall. On March 17, 1953, along with teammate and fellow Buffalo native Warren Spahn, Sisti got permission from manager Charlie Grimm to take a day off and make a quick $100 on an endorsement deal -- big money for a guy whose biggest major league paycheck was $12,000. It was only two weeks before Opening Day, and Sisti said the concept of going to Milwaukee was “as green as apple pie to me.” In other words, he didn’t care for it. He had been in Boston nearly 13 years, and he may as well have stayed there. He had just 23 at-bats during the team’s triumphant maiden season in Wisconsin, and appeared in nine games as a defensive replacement (with no at-bats) in ’54 before being released and then re-signed as a coach. He was 35 years old. Sisti was asked to manage in the minors for the Braves the next season, and later spent a decade at the helm of farm clubs in Quebec, Corpus Christi, Austin, and Sacramento. For several of these campaigns he was a player-manager, inserting himself in at various positions and batting as high as .297. Son Michael often came along, taking batting practice with his dad’s players and eventually had a short stint in the minors himself . Sibby became an infield-outfield instructor with Phillies minor leaguers for a couple of seasons, coached with the expansion Seattle Pilots in 1969, then shortly thereafter quit the game and returned home to get a “real job” as a truck driver. “I had a couple of daughters who got married, so I couldn’t take it easy,” he said with a laugh. “I was no millionaire, and besides, I could make just as much working around Buffalo as I could in baseball as a coach or manager. I had already been in the game nearly 40 years.” During travels before and after his playing days, he brought along a baseball that he eventually had signed by an eclectic group including Hall of Fame ballplayers like Hank Aaron and Al Simmons and first-rate celebrities like bandleader Harry James and comedians Abbott & Costello. A father of five, Sisti settled just outside Buffalo in Amherst, New York, and doted on them and a growing brood of grandchildren and great-grandchildren. He cared for his wife Norine when she became ill in recent years, returned to Boston for a 1988 reunion of the ’48 NL champs, and then continued coming back for all but one of the first 14 annual get-togethers of the Boston Braves Historical Association (BBHA) -- staying away only after major surgery. Along with his 1994 induction into the Boston Braves Hall of Fame started by the Association, he drew recognition from the Canisius High Hall of Fame, the Buffalo Baseball Hall of Fame, and the Greater Buffalo Sports Hall of Fame. His final BBHA appearance came in 2004 at the age of 84, less than two years before his death on April 24, 2006, in Amherst. As usual, he drew the day’s loudest cheers and laughs. When the 2002 convention of the Society for American Baseball Research in Boston coincided with an Atlanta Braves-Red Sox interleague series at Fenway Park, the Super Sub threw out a ceremonial first pitch at the June 28 opener to cheers from a crowd that included many SABR and BBHA members as well as other fans whose Braves caps had a “B” on the front. Atlanta’s 4-2 win prompted Boston Globe writer Bob Hohler to playfully question whether the Sox were under “The Curse of Sibby Sisti.” Sibby’s fellow first-pitch honoree that night was SABR president Claudia Perry. Sibby was no Bambino, but he had two unique claims to fame later in life. In 1973, authors Brendan Boyd and Fred Harris ended their popular volume, The Great American Baseball Card Flipping, Trading and Bubble Gum Book with a page featuring one of Sisti’s cards accompanied by a one-line epitaph beneath it: “Goodnight Sibby Sisti, wherever you are.” Most readers probably had no idea. If they were paying close attention a decade later, however, they found him. In 1983, Sisti was asked to be a technical advisor for director Barry Levinson’s popular 1940-era baseball movie The Natural. Filmed in and around Buffalo’s War Memorial Field, the film told the fictitious story of the New York Knights, a National League team whose struggles on the field and in the stands would be quite familiar to old Braves fans. Sisti helped star Robert Redford (who signed his ball) and other actors with their baseball sequences, and also had a bit part as manager of the Pittsburgh Pirates. An annual highlight of BBHA reunions came when Sibby would reveal the sum of his latest royalty check for his appearance; the checks usually ranged from 65 cents to about four dollars. Hirshberg, Al, Boston Braves: The Pick and the Shovel, Waverly House, Boston, 1948. Hirshberg, Al, “The loneliest player in the majors,” True Baseball Yearbook, 1953.